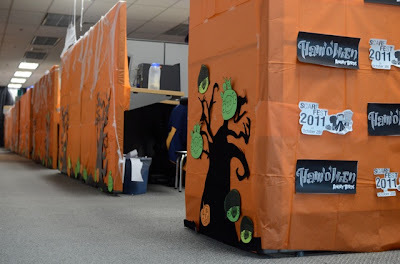 If there's one thing that I love about the company that I currently work for, its the Scarefest -- that day once a year when employees pour out their creative juices dressing up their work stations while kids close to their hearts get to visit in their cutest costumes to go trick or treating. 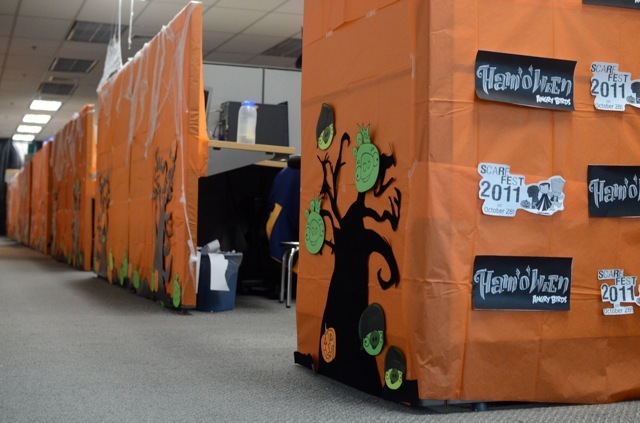 It was one event everyone in the office looks forward to because we get to set aside work even just a few hours and bond with our families and co-workers for some Halloween fun. 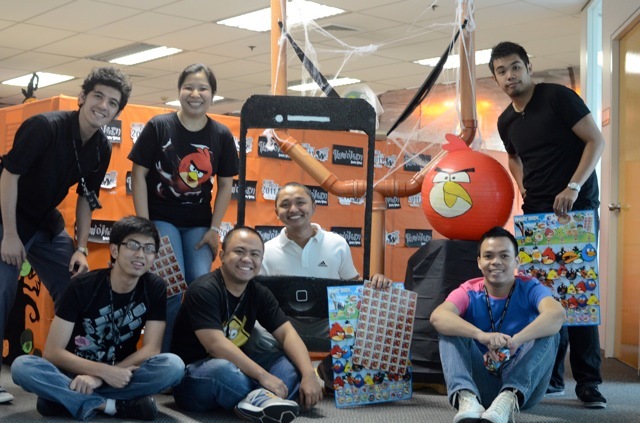 You see, my team's been holding the Best Scarefest Zone title for the past two years. That means we're vying for a grand slam this 2011. 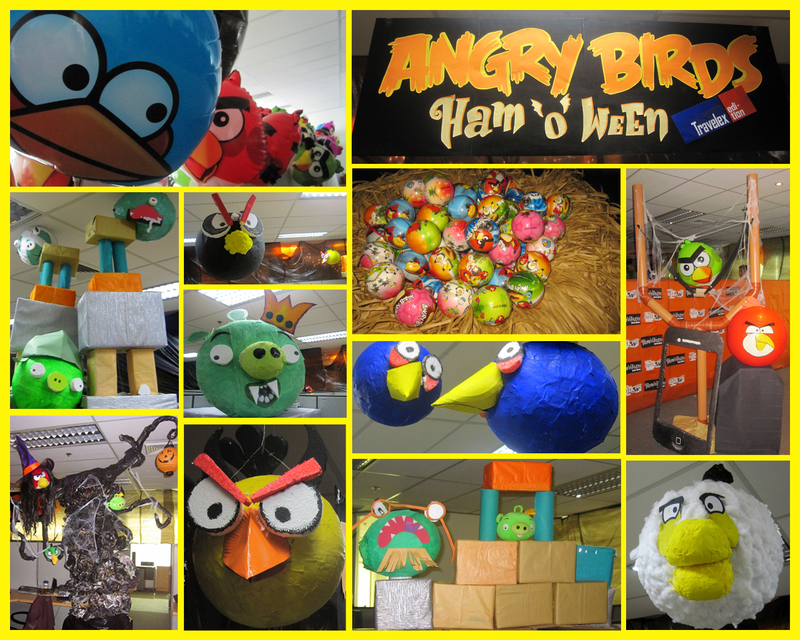 And guess what theme we did? My most favorite bird of them all. I lurrrrve how "angry" it is. Haha. 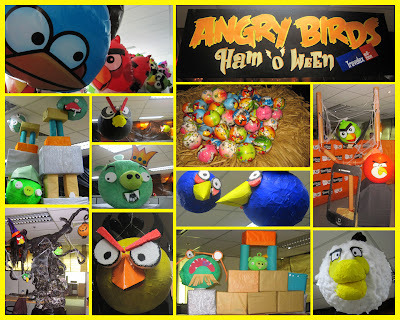 And to complete the peg, we covered the facade with some japanese paper and cutouts of black trees, pigs and pumpkins! Hang some cobwebs for that Halloween effect. By the way, thanks K for the pics! Oh, let's not forget "THE" banner. For the treats, I have to say thank God for Divi land! 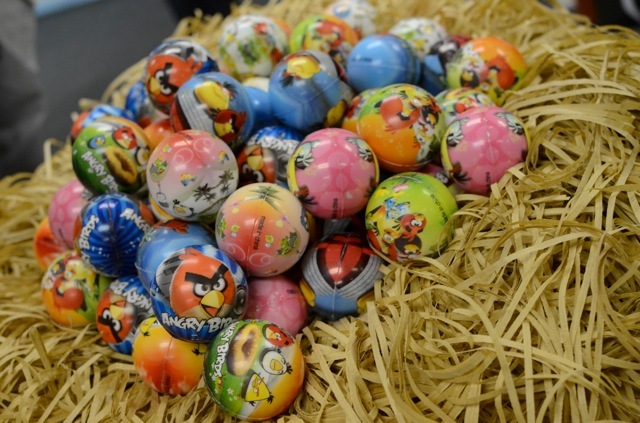 We got Angry Birds balloons, erasers, keychains, pins and stress balls which all made the children giddy! The balls doubled as eggs in the huge nest. The rose among the thorns, Ms. Anne, spearheaded the group. Wait, why am I not in the picture?!?! I have a lot of adorable pictures to share so I'm saving them for another post. Stay tuned!